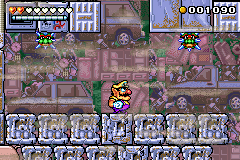 A Spiked Head is one of the many enemies in the Game Boy Advance game, Wario Land 4. Unlike most of the enemies in the game, a Spiked Head is immune to most of Wario's attacks. However, it can be defeated by some of Wario's forms. These enemies are respawnable, reapparing as soon as Wario leaves an area with them if any were defeated. Wario can defeat these enemies through some of his forms, and also by throwing enemies at them. If Wario touches the spikes surrounding a Spiked Head, he will lose health. On Normal mode, Spiked Heads are only encountered in the Sapphire Passage level Arabian Night. On Hard mode, they'll also appear in the Ruby Passage, in the levels The Toxic Landfill and 40 Below Fridge. The number of these enemies increase drastically on those levels in Super Hard mode. This page was last edited on April 23, 2019, at 08:31.